USU Eastern’s sluggers opened the first games at home in sweeping fashion, winning four out of the four games played last weekend. 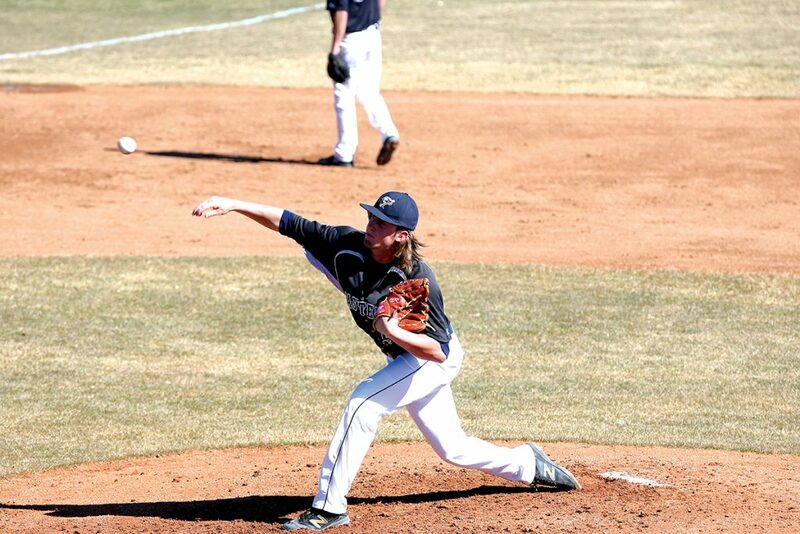 The Eagles faced Colorado Mesa University Mavericks club team in a four-game series over Feb. 26-27, outscoring CMU 41 to 3 over the span of the series. The Eagles offense was relentless in the games, tallying 34 hits and drawing 26 walks while averaging 10 runs per game. The Eagle’s pitching staff was also dominant over the weekend, allowing three runs and giving up 12 hits, while striking out 34 of the Maverick hitters. The scores to the weekend’s games were: 6-0, 17-2, 5-1, 13-0. Coach Scott Madsen was pleased with the effort the team gave in the series, but is already looking forward to the next weekend of games. “We did a really good job this weekend in all areas. Our pitchers threw well. We executed on offense and put the ball in play a lot, putting pressure on them [CMU] and forcing them to make plays…we now need to focus our efforts on preparing to play Salt Lake [Salt Lake Community College] next week. We need to carry the momentum from these games into this next series with SLCC,” Madsen said. Game one of the series is a always pivotal game and starting pitcher Bennett Bradford rose to the challenge throwing a complete game shutout, ensuring a 6-0 win for the Eagles. He pitched seven innings allowing just three hits and striking out 10 Mavericks. “The first game of a series really sets a tone for how we [USUE] will play for the rest of the games. If we go out and jump on a team, it makes it difficult for them to bounce back…winning the first one helped us go out and improve each game after that,” Bradford said. The highlights of game two came from starting pitcher Kirk Haney and the Eagle’s offense. Haney threw his second complete game of the season, pitching five innings, allowing two runs on five hits from CMU and striking out nine batters. The USUE hitters erupted with 17 runs on 10 hits in the contest. Stand outs in the game were Austin Pitcher, who was two for two with one double, two runs scored and three RBIs; and Dallas Jolley, who was two for three with one run scored and four RBIs. Kaiden Longman got the win on the mound in game three, and Colton Hill was the winning pitcher in game four to close out the series. Hill threw three and one-third innings in the final game and struck out seven, an average of roughly two strikeouts per inning. This weekend’s victories was a total-team effort. In reviewing the statistics, it seemed like every player on the roster contributed to the sweep of CMU. The top performances included Bradford, winning game one from the mound and going four for five at the plate with two doubles, three runs scored and three RBIs over the series. Austin Pitcher went four for four at the plate with four runs scored and four RBIs. Ridge Nelson was a tough out at the plate, drawing six walks in 10-plate appearances. The Eagles’ game against SLCC that was scheduled for March 2 in Price has been moved to March 5 at SLCC. The Eagles will play a four-game series at SLCC’s Cate Field, located at 3491 West Wights Fort Rd. West Jordan, UT, 84088 on March 4-5.